If you're getting into making music you may be checking out Reason Limited for the first time as well. Just what is Reason Limited about? Included with products from third party manufacturers, Reason Limited is an all in one music production program that gives you many of the features found in our flagship software Reason—while keeping some of the complexity in check. At the heart of our entire Reason line of software is its legendary creative flow. The studio rack, the sequencer, and the interactive way sound is controlled in Reason Limited means you can stay focused on the one thing that's most important to you: making music. And when you need more, upgrade to Reason to finalize your songs, using all the instruments, effects, mixing and editing tools the full version has to offer. At the heart of Reason Limited is its rack. This virtual studio, complete with rack rails, gear, and cables, is where your song's instruments, effects, and mixing tools all come together. Unlike a real studio, you'll never spend one minute tugging on cables to see where they go and when you need another synth or sampler you don't start saving up money, you just drag one into your song and the cables connect automatically. Reason Limited's rack is as interactive or automatic as you want it to be. If you're a right-brain type who's focused on the music, the rack wires itself exactly as you'd expect. Instruments connect to the mixer. Effects connect to FX sends and returns. If you're more left-brain however, the rack is there to be wired, rewired, and routed into complex custom configurations. A generous bank of sounds and presets will get you started quickly. In fact you'll probably even hit upon some new ideas just by browsing the patches. Reason Limited songs can have up to 16 tracks — 8 instrument tracks and 8 audio tracks — for some seriously complex arrangements. 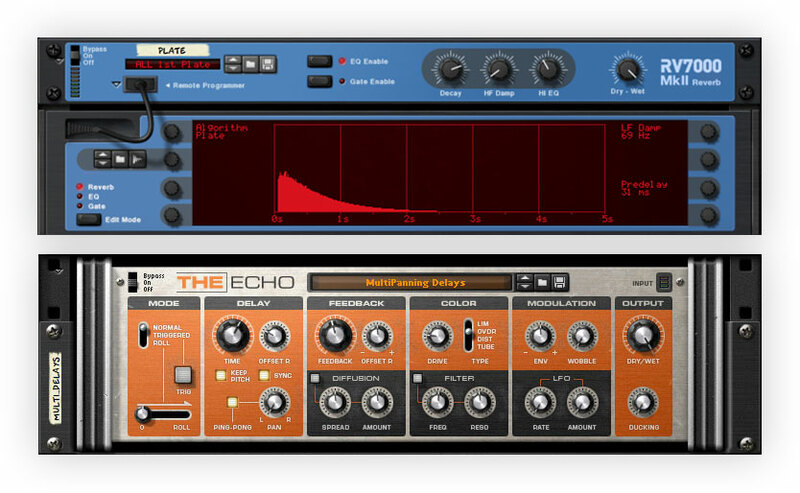 We've included all the most fundamental tools for the songwriter: drum machines, synths, samplers, effects, and even precision mixing tools like parametric EQ, compressors, and limiters. When your songs are ready for the next level, we've got you covered. Reason Limited is part of a product family. 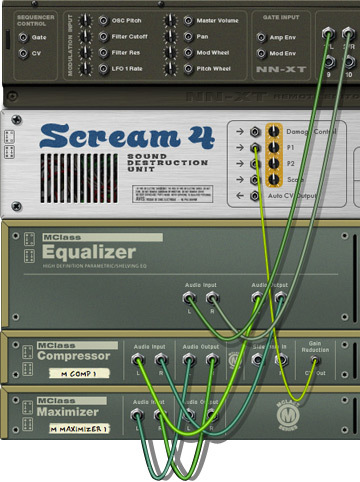 As you move up the chain, your music gains more advanced and powerful sonic tools. Our flagship Reason software includes every device possible in the Reason rack with advanced synths, a pitch corrector, modeled channel EQ/dynamics, a beast of a drum machine, and much more. Although Reason Limited is a self-contained program, it's no lone wolf in the studio world. Two key technologies make Reason Limited a well adjusted and quite sociable citizen in the software studio. Mouse and computer keyboard may do the job most of the time, but when you want hands-on tactile control of your music making, Remote is there to save the day. With the Remote technology, Reason Limited comes with built-in support for all major controllers and keyboards available on the market. Knobs, faders, displays and buttons are already set up for each Reason Limited device. You can use one controller as your master keyboard and use another for just the mixer, for instance. Remote is there right out of the box. Nothing to configure, nothing to install. It just works. If you want to use Reason Limited with other software products, ReWire is there to help you. ReWire works like an invisible cable that handles audio, MIDI, and sync between music applications. 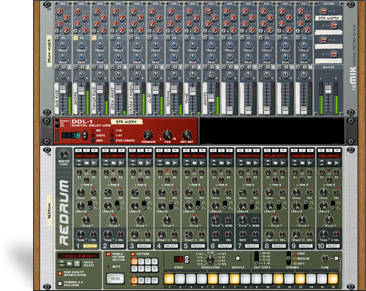 Reason Limited can become a rack of instruments and play alongside another program, or sequenced entirely from the host application. ReWire has grown into an industry standard and is used in applications like ProTools, Logic, Cubase, Live, Sonar, and many more. Sure 16 tracks may seem like plenty when you're starting out and perhaps our Subtractor synthesizer is more than enough to keep you satisfied... for a while. But what happens when you start to feel like you've outgrown Reason Limited? Or what if you'd like to see what adding new synths, samplers, effects, and mixing tools would do for your sound? If you're ready to take your music to the next level, we're ready to take you there. Reason Limited can be upgraded to our flagship software, Reason. Reason Limited owners qualify for a special discount upgrade to Reason. If you'd like to add Clip Safe recording from our Balance Audio interface, you'll also be upgrading to Reason Essentials which comes with the Dr. Octorex Loop Player and Master Bus Compressor. To get a sense of what each product has to offer, take a look at this breakdown and visit the Reason product pages to see detailed information on each feature. When you're ready, contact your local reseller or visit our online shop to purchase your upgrade. * All product names used are trademarks of their respective owners, and in no way constitute an association or affiliation with Propellerhead Software or companies interviewed. Any products or trademarks mentioned are solely used to identify the products whose sound was studied during development and/or for comparison purposes only.